Villa Triton is overlooking the bay of Milatos and is located only 2km from Milatos village and 5km from Sisi. The villa offers large lawn and large private pool with a pool deck with sou loungers and outside bar with cooling system and built in BBQ. The accommodation is divided into three floors, an open plan on the first floor consists of a fully equipped kitchen, living area and dining area, with large terrace, with additional dining and sitting facilities. A central staircase leads to the lower floor where you will find 2 large double bedrooms both with en-suite and a laundry room. On the top floor there is a master bedroom with en-suite bathroom and large balcony with sun lounges. Eighteen years ago my husband and I came to Crete for the first time on a holiday. It was love at the first sight and it didn't take too long when we decided to buy a piece of land and built our holiday home. After having enjoyed our own ‘home away’ for a few years and getting to know the local people and the surroundings a little better, we decided to construct a few villas for rent for luxurious holidays. We were convinced that Sisi and its surroundings are ideal for holiday makers that value tranquillity, privacy and comfort. 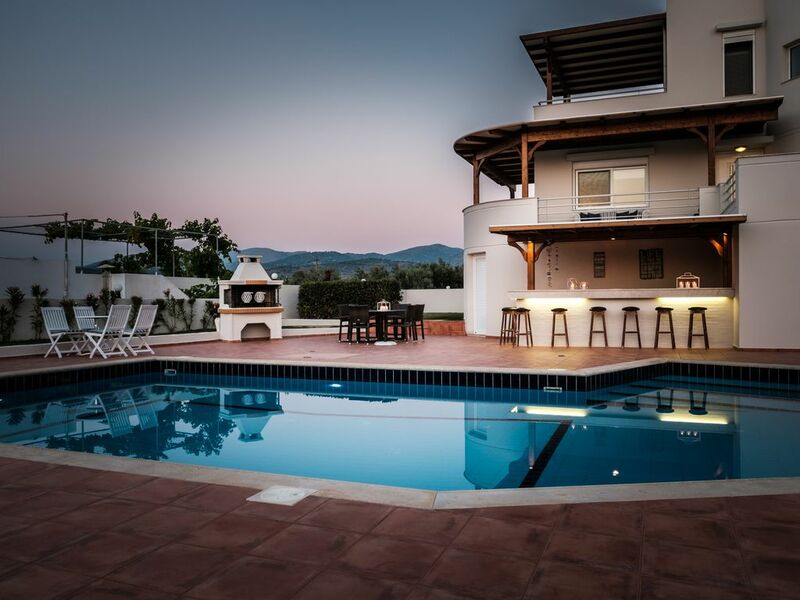 In the meantime other villa owners joined Luxury villas on Crete and started renting their villas through us. Together we make sure that our guests are being taken care in the highest standards and that they spend here on the beautiful island of Crete their unforgettable holiday in lavish, comfortable and luxurious surroundings. Two additional toilets one on ground floor and one outside. Triton was clean and tidy. There was a lot of space and balconies to sit, reading and catch the sun as it moved around. The pool kept the children entertained. The TV didn't go on once. We had a lovely relaxing break. Thank you for your lovely feedback, it is our pleasure to have satisfied guests who they trull enjoy their holidays in our beautiful island. Comfortable and very clean, but for luxury lacked some basics. Location is good. Property staff very helpful, friendly and with great knowledge and recommendations of local services and places to visit. Our stay at Villa Triton was relaxing and rejuvenating. We were a party of 5, 2 couples and my 90 year old Mother. The Villa is spacious, light and airy and we liked having the master bedroom suite at the top and a separate bedroom floor beneath the living area that ensured space and privacy when wanted. The kitchen is big and well equipped and much thought put into storage space in the bedrooms so plenty of wardrobes, cupboards and drawers! Also, the beds were not quite so hard as often experienced in Crete! The outside terraces and garden are well maintained with lots of seating and tables for al fresco eating. The surrounding area was quiet however not isolated as Milatos and Sissi are a very short drive away. Sissi has a lovely harbour with swimming, bars and tavernas and both villages have ample shopping. For those needing a town buzz - Malia is only 10 minutes drive and my favourite, Agios Nikolaos, 45 minutes drive on easy roads. Our only challenge was the stairs to the garden and terrace area that meant my Mother (who is 90) tended to go down in the morning and go back up in the evening so we did her 'running' for her! Audrey is an excellent host, attentive and eager for you to have a wonderful holiday'. Heerlijke week gehad in deze ruime en schone villa met zwembad en prachtig uitzicht! Ligt mooi rustig, tussen Sisi en Milatos, er genoeg te zien en te doen in de (wijdere) omgeving. Zeer gastvrij ontvangen (dank voor de flessen koud water en koude cola in de koelkast :-). Alles was helemaal prima in orde! Located just outside the traditional village of Milatos, North East Crete, in an elevated position on the hillside with easy access from the road. The villa enjoys spectacular views over the valley towards the village, fishing harbour, beaches and sea. Set in its own secured grounds with dedicated parking areas the villa is far enough away from the busy holiday resorts yet close enough to take advantage of their facilities for shopping and dining. Just 2 km below the villa you can enjoy the waterfront fish tavernas of Milatos and safe swimming beaches.